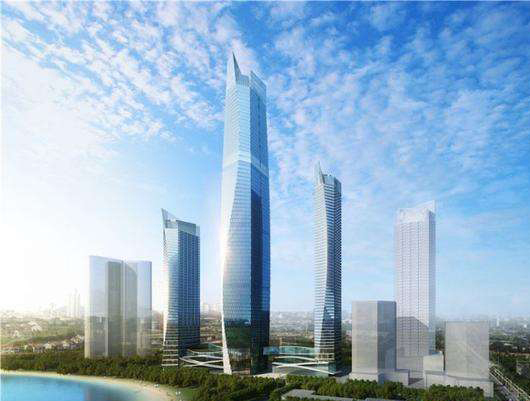 In recent years, with rapid development of the economy, many Asian metropolitan areas have had an upsurge in super high buildings. In particular in China, buildings with a height of more than 300m are constantly springing up. The construction of super high buildings provides effective land-use for densely populated urban areas, which facilitates people's living and commercial activities. Among these, "longitudinal mobile infrastructure" -- elevators are essential. Hitachi Elevator installed elevators with the highest speed (300m/min), at that time, in the late 1960 's for the pioneer "Kasumidasek Building". Since then, Hitachi Elevator has been committed to developing "super high-speed and large capacity" elevators. Unlike conventional vertical elevators, "super high-speed and large capacity" elevators need to maintain safety, comfort and reliability in a limited shaft, limit loads and speeds as a result of integrated elevator technology. The birth of super high speed elevators has also produced a new encyclopedia on elevator technology. The super high speed elevator technology of Hitachi Elevator is one of those models. With the increase of speed, tractor supplying power, and each part carrying power output will be challenged in terms of volume, toughness, life, and so on, due to the increase in output strength. For this purpose, our super high-speed elevator needs to be tailored by research and development. Taking the world's highest-speed elevator (used in CTF Finance Center) as an example, we have developed a leading global technological achievement. The super high speed tractor is restricted in terms of volume, hoisting, etc. We have developed a tractor with a thickness 10% less than the previous ones, and output power of 1.4 times, which solves the problem caused by the volume of traction machines. According to the convention, 600m of steel wire rope will weigh more than 15 tons, which will limit the realization of ultra-high-speed movement of an elevator. In this regard, we developed a new type of wire rope for ultra-high speed elevators, which can reduce weight by 30%. The elevator runs at a super high speed, generates more operational loads, and provides greater challenges to the safety performance of the elevator. In this regard, we carefully study and apply leading technology to ensure that the operation of the elevator is within the scope of safety. ABraking Material that can Resistant Temperatures above 300 Degrees Celsius. Hitachi has developed a completely new, high temperature resistant material, even if the brake creates a temperature above 300 degrees Celsius during braking. It can still safely stop the elevator from falling in an emergency. Although one wire rope is sufficient to pull the weight of N cars, and there are dozens of such wire ropes together, we cannot ignore extreme conditions. The emergency brake device, developed by us, can ensure that even if every steel wire rope breaks at high speed, the elevator can still be safely braked. When the car is running at high speed in a closed shaft, air flow outside the car will cause a change of air pressure inside the car. Any microscopic vibration will be amplified due to the high-speed motion. For this, our super high speed elevators must be exact and scientific during the operation process, taking the whole process into account. Hitachi's new technology for car movement has also been applied to the world's highest speed elevator. Through a simulator, the super high speed elevator can control air pressure in the car in stages, according to the actual running state of the elevator, to fully, automatically relieve possible tinnitus and ear pressure discomfort for passengers. On the basis of past experience, we have developed a streamlined capsule structure for the car, which enables elevator movement to be more stable, comparable to a high-speed train, quiet and comfortable.